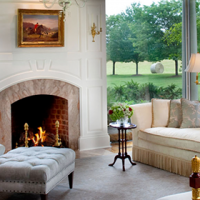 Floor covering designers are influenced by design leaders who, in turn, are influenced by popular trends showcased in places like New York Fashion Week, lifestyle magazines and media outlets. On the color side, a strong trend that is emerging for 2018 is the use of grey in flooring. This will become the new ‘classic’ and can be used for modern styles, especially Scandinavian and Minimalist interiors. There are many different ways to utilize grey, from a dark charcoal vinyl faux wood to a pale ash-white engineered floor against a dark grey wall. A new twist on grey for this year has been the emergence of a warmer-toned pallet of grey flooring, something that is now referred to at ‘greige’. This is a color between grey and beige! So, if you cannot choose, this makes for a great compromise. However, dark flooring colors are still very popular, with a classy, dark espresso colored hardwood dominating. The dark tones can bring up the contrast in a room when paired with light-colored shelving and furniture, making interiors look and feel very luxurious. Dark wood flooring can act as an instant “upgrade” for an outdated space and give a room a more sleek and modern design. If you cannot decide between dark and light, then you are in luck! 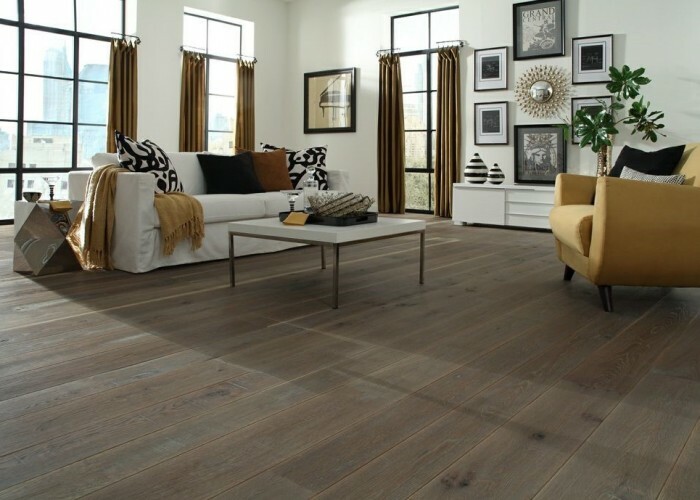 A new trend this year that has grown is the use of high variation wood flooring. With this trend, various hues like walnut, expresso, honey and blonde are mixed together to create more visual interest within individual wood floor boards. The end result means that there is much more visual interest throughout the floor and it provides a great backdrop to both contemporary and vintage styled spaces. While color trends are making new strides this year, the other burning question is always “what should the finish be?” While in the past a high gloss finish was very sought after, the trend this year is for a matte finish – both for a different look and because it is easier to maintain, making upkeep more of a breeze. No matter what your color preferences are, you can come into Sparkle Floors and Carpet and see a wide variety of colors and types of flooring, from hardwood and vinyl to carpet and engineered wood. Our showroom has a wide selection and our installers are the best! Give us a call to book your free, no obligation quote for updating your flooring. 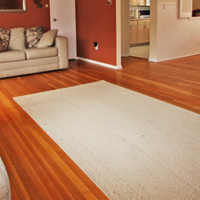 When Should You Refinish Your Wood Floors? As tough and beautiful as a wood floor is, it’s really no match for a family. Every year, the wooden floor gets worn down with spills, drops, grit tracked in on shoes, shifting furniture, and worst of all, the scrabbling claws of family pets. 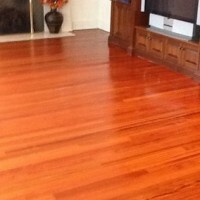 But the question remains…how do you determine when it is time to refinish your floors? If your floors have been stained prior to being finished, they can look worn sooner than if your floors are a natural color that has a clear coat on it. The best thing to do is to ask us to come out and do a free, no-obligation quote. It may be possible to simply lightly sand your floors and put on another clear coat of polyurethane instead of doing a full refinishing. Or, we may be able to do a full refinishing only in the places that show the most wear and tear. 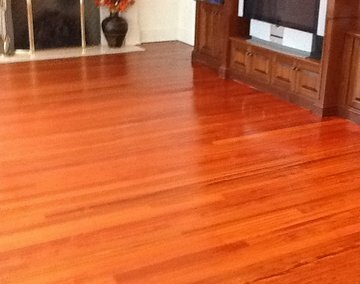 Once we have assessed your floors, we can give you a quote for what is the best type of refinishing. If you are looking to refinish your floors as part of an overall remodel, our crews would come to refinish after the ceilings and walls are done, but before the baseboard and/or quarter round molding is put down. This way, we can be sure and sand to the very edge of the floor. (However, if the floor is to be stained, the baseboard and quarter round would need to be put down prior to the final refinishing of the floor). Our dustless system ensures that we do not get dust where it should not be and our careful crews take great care in not marking the walls. We take great satisfaction in refinishing an old hardwood floor and bringing it back to a glorious shine that transforms the entire room. So, do you want your floors to sparkle? Then give us a call at (908) 464-2653 and we will be happy to come and give you a free quote! School has begun and before you know it, winter will be upon us! As we enter into the cold season, many of our customers ask us how to care for their hardwood flooring during the winter months. 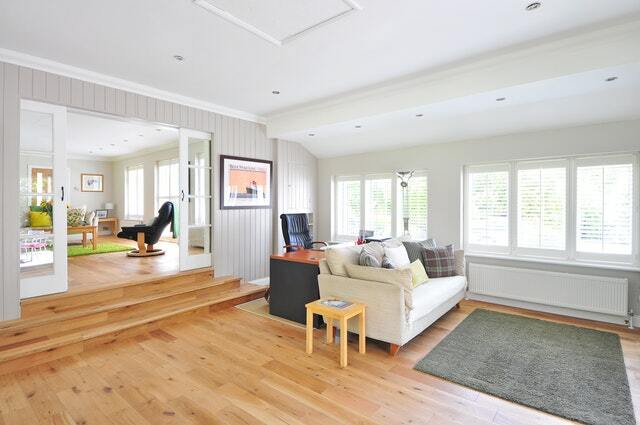 When it comes to wood or other hard surface flooring, it is important to keep them clean. We want to make sure your floors are protected from extra debris that can be tracked in from the outside, and the salt and sand can scratch wood and eat away at protective finishes. It’s also important to realize that proper vacuuming and stain treatment / protection goes a long way toward keeping carpets looking new. Therefore, we decided to compile a simple list for you to follow when the winter months come, so that your floors and carpets stay good as new! 1. 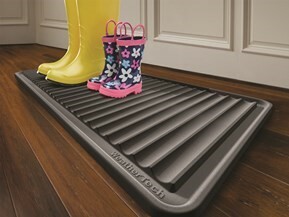 Make sure you put floor mats on both the outside and the inside of entry ways. 2. Have a specific place to put wet shoes so that the excess water doesn’t get to your floors. 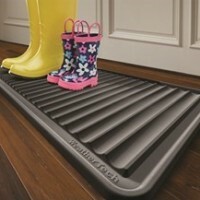 Consider having back up mats to ensure that they are always clean and dry to best absorb water. 3. Vacuum the salt and / or sand right away. Some debris is bound to be tracked in your house past the floor mats, so be sure to vacuum any visible salt or sand so it doesn’t get into the flooring or carpets! 5. Get your carpets cleaned now! Most manufactures recommend cleaning your carpet every 18 months, and now is a great time since the winter usually leaves us indoors. Clear out that dust and dandruff left behind now and don’t breathe it in all winter! Most homes have entryway in the back of the home where children come in from play, or guests use it to access the backyard or deck. In some cases, there is actually a ‘mudroom’ where people can take off their shoes or hang their coats. Choosing the flooring for this room is a very important task. Because of the elements, with actual mud and water being racked in, durability is the most important factor to consider. Next, how does it look and how does it blend with the rest of the décor in the home? Here are some flooring options to consider when deciding what to put on the floor in your mudroom. Natural stone can be a great selection for a mudroom. Slate is one of the most used natural stones and it comes in many colors and textures. The texture is good to act as a ‘non-slip’ surface. Natural stone does need to be sealed in order to keep out moisture. It would need to have the sealing material applied at least once per year. Ceramic tile has come a long way from the shiny pink squares that used to be in 1950’s style bathrooms! Ceramic has morphed into many different types of surfaces, and can even look like wood planks! Ceramic tile can be fabricated to imitate many difference natural surfaces such as natural stone, all types of wood and even bamboo. Wood can still be a good choice for a mudroom. However, you have to be careful what type of wood you choose. A soft wood can show wear and tear in a high traffic area such as an entryway. It is best to put down a natural hardwood (if it is stained it will show traffic wear sooner than a natural wood) or reclaimed wood that already had ‘wear and tear’ as part of its charm. Using a sturdy rug as the centerpiece of the entry way is also a way to ensure it does not show undue signs of traffic. 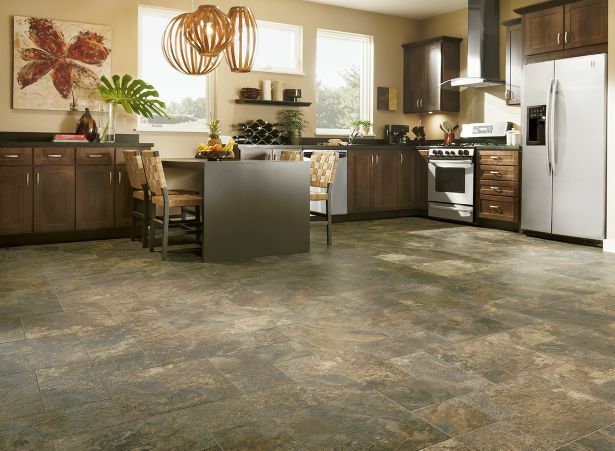 Vinyl flooring has also come a long way since the 1950’s style of little squares or basic rolled goods! Vinyl, similar to ceramic, can now come in many different styles, textures and can mimic many natural surfaces. There are specialty vinyl flooring types that are made for ‘wet’ areas, and the underfloor and adhesive are also made with dampness in mind. 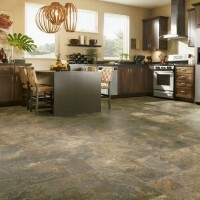 Vinyl flooring is a great way to have a ‘fuss free’ floor that will tie right into the décor of the rest of your home. As you can see, there are many different types of flooring that you could choose for your entryway or mudroom. The best advice we can give you is to come into our showroom and talk to the experts, see the samples and then make the best choice for your home once you have all the options in from of you! We look forward to seeing you at 451 Park Avenue in Scotch Plains or call us on 908-464-2653. For many years, hardwood was considered one of the best options for creating a beautiful floor in a home. However, technology has given us many other options! One of the hottest trends in the flooring industry is the production of porcelain tile that looks like natural wood. Because it is manufactured and not grown, the consumer is not limited to traditional sizes. And, thanks to advancements in technology and the manufacturing process, ceramic “wood” tile contains a level of detail that was not previously possible. It is now possible to mirror the look and feel of a hand scraped wooden floor! We carry several different manufacture’s in the area of ceramic “wood” tiles that were designed with the focus on performance and durability as well as how they look. 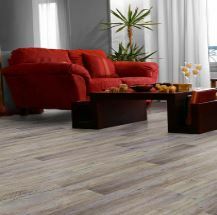 This type of flooring is appropriate for both residential and commercial applications, and thanks to the sophistication of the manufacturing techniques they are extremely durable. If you are unsure about your next choice of flooring, please come by our showroom and look at all the possibilities. 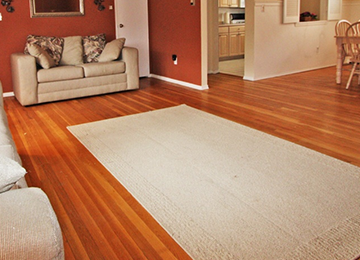 We will work with you to determine what type of flooring will best suit your needs in particular areas of your home. Be sure and ask us for our no-cost, no-obligation measure and quote service. 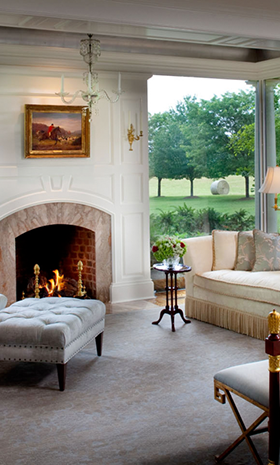 We look forward to helping you create the ultimate home environment for you and your family! Stop by and see us at 451 Park Ave in Scotch Plains or call us on (908) 464-2653. We look forward to hearing from you! 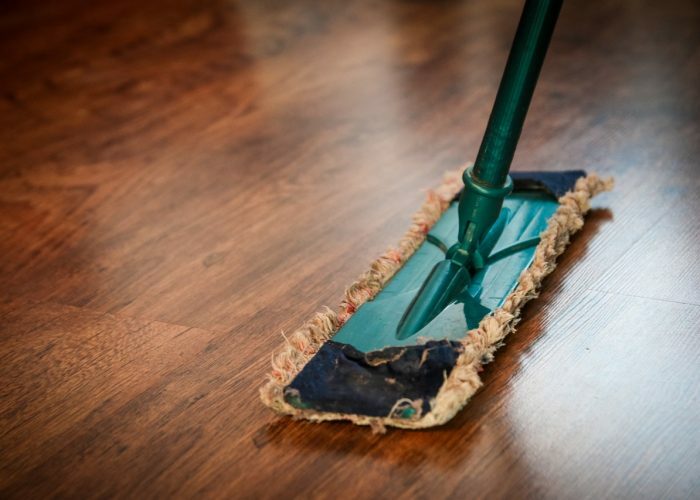 We’d like to start the season off right by paying it forward and sharing some tip hardwood floor cleaning tips! 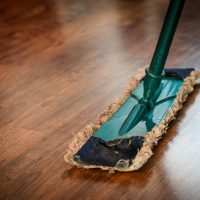 The good news is that if you have hardwood flooring and have been maintaining it throughout the year, then this part of spring cleaning won’t be too much hassle. 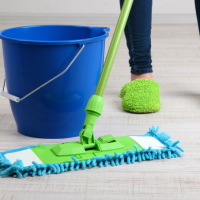 The bad news is that, like most of us, life is too hectic to keep up with floor maintenance, we might have to use a little more elbow grease and some key ingredients to bring your floor back to life. You need to choose the best products for your hardwood finish, so our first tip is to determine whether your floor has been sealed with a finish like urethane, and those that haven’t (or have been finished with lacquer or shellac). Most newly-installed floors are the first kind and have been sealed in this way to provide the most easy-care option possible for modern life: because these surface-sealed floors are very resistant to water and stains, all you need to do is sweep and then damp-mop them with a hardwood floor cleaning solution. 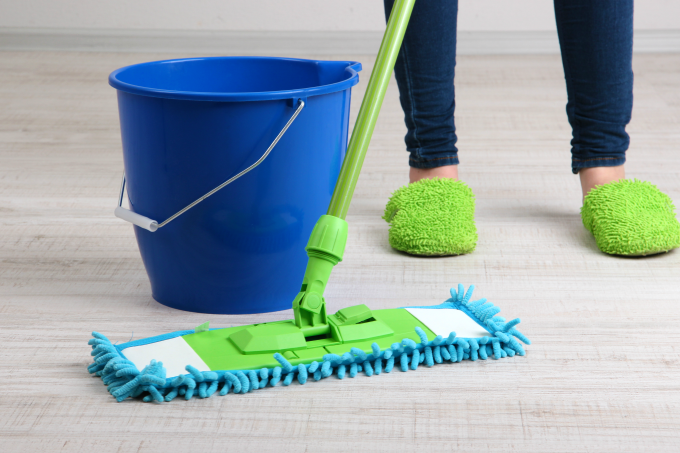 For non-surface sealed floors, because they are a lot more sensitive to water penetration you must avoid mopping at all costs! 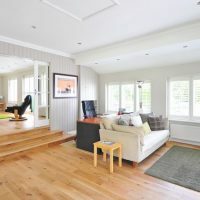 Instead remove dust and dirt build-up by simply sweeping or vacuuming on a regular basis, and then once a year provide the floor with some intense TLC: gently strip back old wax using mineral spirits or a recommended hardwood wax stripper, then nourish the wood with either fresh liquid or paste wax, and finally buff the floor up to a shine. Another tip is to use the right vacuum cleaning head on your hardwood floor – it must be a brush or felt head! Any other kind of vacuum head is liable to dent or mark your floor. You also want to make sure that the wheels of your vacuum cleaner aren’t scratching your floor, and if they do, apply sticky backed felt tape to the wheels. Another great way to “vacuum” is to use a microfiber dusting pad, which will trap the dirt and debris just as well as a standard vacuum cleaner. For more tips, continue to read our blog or feel free to give us a call or stop in our new showroom. We are always eager and happy to help! Do Your Floors need a Spring Update? Spring is trying to arrive, and with the ‘renewal’ of all things plant-like it can put you in the mood to do a ‘renewal’ on your home. Would your floors benefit from a spring update? If you have hardwood floors, we can come in and asses if you need to do a complete sanding and refinish or would an application of a top coat suffice? If your floors are heavily damaged or if the finish is completely worn through, we can use our ‘dustless’ refinishing system to give your floors a new lease on life. We work with you and your family’s schedule to select the best time and complete our work in the shortest amount of time possible, so we inconvenience you as little as possible. If your floors need to be replaced, we can work with you to determine if you need new hardword, engineered hardwood or a variety of other options such as laminates and bamboo. 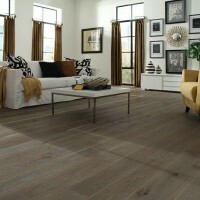 You can come into our showroom and see many varieties of flooring. We also carry carpet and amazing vinyl options. If you are contemplating a new addition to your home, please reach out to us in the planning stage so that we can work with you to select the perfect type of flooring for your needs. Spring is all about renewal and new growth. Come in and see us if it is time for your floors to be new again!